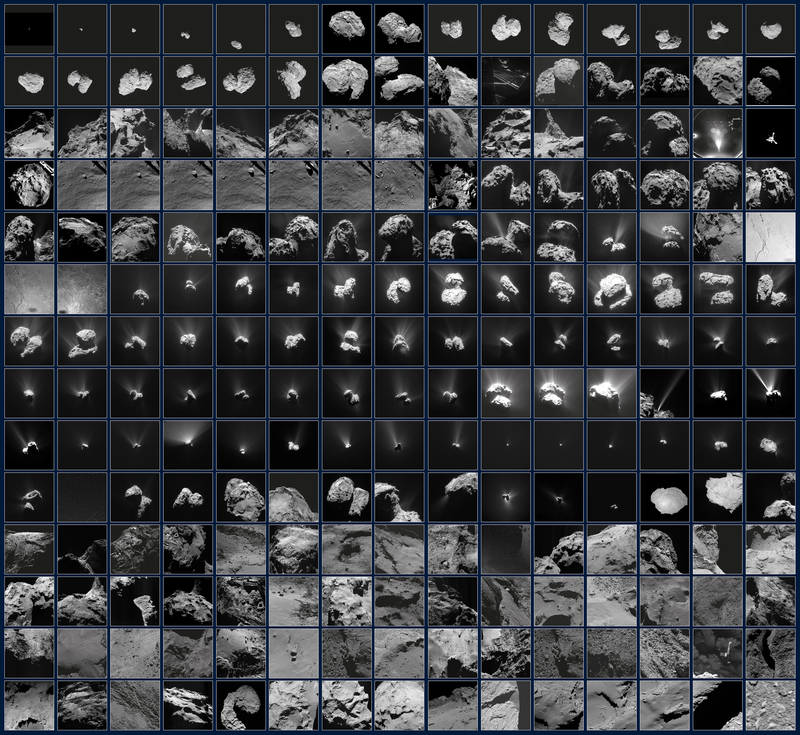 These 210 images reflect Rosetta's ever-changing view of Comet 67P/Churyumov-Gerasimenko between July 2014 and September 2016. The sequence begins in the month leading up to Rosetta's arrival on 6 August, when the comet was barely a few pixels in the field of view. Suddenly, the curious shape was revealed and Rosetta raced to image its surface, coming within 10 km, to find a suitable place for Philae to land just three months later. Philae's landing is featured with the 'farewell' images taken by both spacecraft of each other shortly after separation, and by Philae as it drew closer to the surface at its first touchdown point. An image taken at the final landing site is also shown. The subsequent images, taken by Rosetta, reflect the varying distance from the comet as well as the comet's rise and fall in activity as they orbited the Sun. Before the comet reached its most active phase in August 2015, Rosetta was able to make some close flybys, including one in which the lighting geometry from the Sun was such that the spacecraft's shadow could be seen on the surface. Then, owing to the increase of dust in the local environment, Rosetta had to maintain a safer distance and carry out scientific observations from afar, but this also gave some impressive views of the comet's global activity, including jets and outburst events. Once the activity began to subside, Rosetta could come closer again and conduct science nearer to the nucleus, including capturing more high-resolution images of the surface, and looking out for changes after this active period. Eventually, as the comet returned to the colder outer Solar System, so the available solar power to operate Rosetta fell. The mission concluded with Rosetta making its own dramatic descent to the surface on 30 September 2016. A selection of the final images taken are reflected in the last images shown in this montage. See a version of this image as a movie. Explore thousands of Rosetta images in our Archive Image Browser.